For decades Pope John XXIII has been championed by many “Spirit of Vatican II” Catholics as the visionary who opened the Second Vatican Council by calling for “aggiornamento”, an updating of the Catholic Church for the modern era. In the years since the Council a narrative which promotes rupture over continuity has been taught by many within the Church, particularly at the parish level. Many on the left, often those in positions of authority, have presented the faithful with a new form of Catholicism which never existed prior to the Council. It is safe to say that very few Catholics today would label Pope John XXIII as a traditionalist. After all, didn’t he first announce the need for a new council only three months into his papacy? However, consider Veterum Sapientia, Pope John XXIII’s Apostolic Constitution on the study of Latin which was released in February of 1962, just eight months before the opening of the Council. In the years since it’s release this document has drifted into obscurity. In fact the Vatican’s own website does not even provide an English translation of it. Reading Veterum Sapientia today one might think they are studying the work of an ardent Traditionalist. Has there been a more definitive litmus test in the years since the Council than one’s view of Latin and its necessity? After all, didn’t the post-conciliar Church honor the the spirit of “aggiornamento” by effectively expelling the lingua antiqua from the everyday life of the faithful? …(the document) which had been so loudly praised as useful and opportune, was completely wiped from memory and is not cited in any conciliar document. Some biographies of John XXIII do not mention it at all, just as if it did not exist, and never had; while the more arrogant accounts mention it simply as an error. There is not, in the whole history of the Church, another instance of a document’s being so solemnly emphasized, and then being so unceremoniously cast out so soon afterwards, like the corpse of an executed criminal. There has been a great deal of attention once again paid to Pope John XXIII this past year due in part to the commencement of the Year of Faith, as well as the commemoration of the opening of the Second Vatican Council and more recently the announcement of his canonization scheduled for April 2014. 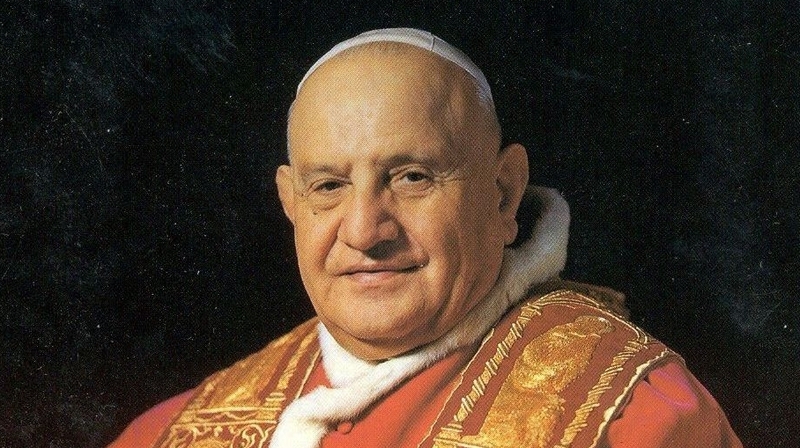 In order to provide a more accurate and complete picture of Pope John XXIII and his defense of tradition, it is important to look at the document which has been “completely wiped from memory” in the post-Conciliar years. “Furthermore, the Church’s language must be not only universal but also immutable. Modern languages are liable to change, and no single one of them is superior to the others in authority. Thus if the truths of the Catholic Church were entrusted to an unspecified number of them, the meaning of these truths, varied as they are, would not be manifested to everyone with sufficient clarity and precision. There would, moreover, be no language which could serve as a common and constant norm by which to gauge the exact meaning of other renderings. “It will be quite clear from these considerations why the Roman Pontiffs have so often extolled the excellence and importance of Latin, and why they have prescribed its study and use by the secular and regular clergy, forecasting the dangers that would result from its neglect”. One wonders just how many “Spirit of Vatican II” Catholics have ever actually read Veterum Sapientia. Posted on November 4, 2013, in holiness and tagged iota unum, john xxiii, romano amerio, spirit of vatican ii, the study of latin, veterum sapientia. Bookmark the permalink. 5 Comments. I have admittedly been somewhat uncomfortable, as I am sure many others have, with Blesseds John XXIII and John Paul II being canonized together as they will be next year. On the one hand, it almost seems as though the one who “stirred up the ruckus,” so to speak, and the one who then spent years calming it down are both being placed somehow on the same level–that is, until someone such as yourself clarifies the fact that John XXIII, in reality far more traditional than most Catholics today, began a process through the calling forth of Vatican II which JPII then solidified and made sense of for all time through the new Catechism and his many other solid encyclicals, and all done as one who had attended and supported Vatican II himself, as did Pope Emeritus Benedict XVI. The very two Popes who supposedly, in the eyes of some, rained on the parade of clown Masses and “womynpriests” and the like are the only two in history who attended Vatican II and took active part in it, and then lived long enough to help interpret, first-hand, its significance to the world. Further, I think it is worth noting that JPII is named after the three previous Popes, as well as the patron saints behind each of them, and the first of those was John XXIII, who began the Council, and then Paul VI, who finished the Council while remaining far too traditional for the same folks who today would see the Church become a mere social club or society. They (John XIII and JPII) truly do “bookend” and seal the deal on the REAL “spirit of Vatican II,” and each of them have given an immense gift to the Church in the modern world. And yes, as you stated, and as is indeed true of Pope Francis as well, were men of God who carried, albeit in very different ways, the unchanging Tradition of Catholicism without in that process forgetting that we are now in the 20th/21st century. And that, in fact, was the main purpose of Vatican II all along. Lastly, I find it ironic, as I now am part of and attend a parish run by the Priestly Fraternity of St Peter, that the very version of the Tridentine Mass which we use is from the 1962 Missal, and that particular Missal was issued during John XXIII’s reign as vicar of Christ on earth! He not only promoted the Latin Mass but helped to solidify its place in the Church, as he also did with Veterum Sapientia, as you so lucidly point out. Maybe they do belong together after all (these two Blessed Popes, that is!). Thanks so much for a nice article, and for pointing out a document not only worth reading but which was literally given to us from the very hands of the one who signed Vatican II into existence. There is no conflict between the two Popes nor the pre or post-Vatican II Church. Both are valid and necessary. RICHARD’S THOUGHTS–I have admittedly been somewhat uncomfortable, as I am sure many others have, with Blesseds John XXIII and John Paul II being canonized together as they will be next year. On the one hand, it almost seems as though the one who “stirred up the ruckus,” so to speak, and the one who then spent years calming it down are both being placed somehow on the same level–that is, until someone such as yourself clarifies the fact that John XXIII, in reality far more traditional than most Catholics today, began a process through the calling forth of Vatican II which JPII then solidified and made sense of for all time through the new Catechism and his many other solid encyclicals, and all done as one who had attended and supported Vatican II himself, as did Pope Emeritus Benedict XVI. The very two Popes who supposedly, in the eyes of some, rained on the parade of clown Masses and “womynpriests” and the like are the only two in history who attended Vatican II and took active part in it, and then lived long enough to help interpret, first-hand, its significance to the world. I would not label him a traditionalist. Traditionalism is really a backlash against liberalism. God calls us to neither. God calls us to be orthodox to the Seat of Peter. He is orthodox to the Seat of Peter; the Church universal. No, he’s not a traditionalist. Magnificent and true on the part of S. S. Sanctvs Ioannes pp XXIII, S. S. Sanctvs Ioannes Pavlvs pp II and S. S. Pivs pp XI. Latin needs to be the true language of the Holy Roman Church and its Mass.